A story about the fight for justice to right a terrible wrong, about the strength of solidarity in the face of tragedy. 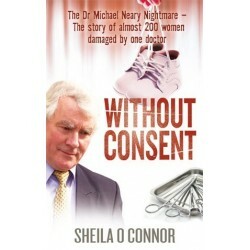 Without Consent is the horrific true story of what happened to women in a modern Irish hospital, Our Lady of Lourdes, Drogheda. Over the course of 25 years, Dr Michael Neary betrayed his patients, his profession and himself by unnecessarily removing the wombs, and sometimes ovaries, of a large number of women. Young women were denied the chance to become mothers, instead being forced to suffer early menopause, while many older women had healthy organs removed for non-existent diseases. These women lost their faith in a hospital system they depended on. The story only emerged when a brave midwife, “Ann”, told the truth, leading to one of the greatest scandals in modern Ireland. This is also the story of managers and health officials who did the right thing in the face of powerful opposition, and stolen or altered medical records. But most of all it is the story of the families, especially the women involved, who got together, took comfort from each other and ensured change for their children’s sake. They fought medical secrecy and denial, political and official apathy, local opposition and legal obstacles. Along the way, they had help from trusted doctors, lawyers appalled by what was unfolding and politicians who finally responded to people power.